This splendid portrait of the bride and groom was captured during a wedding at One King West . 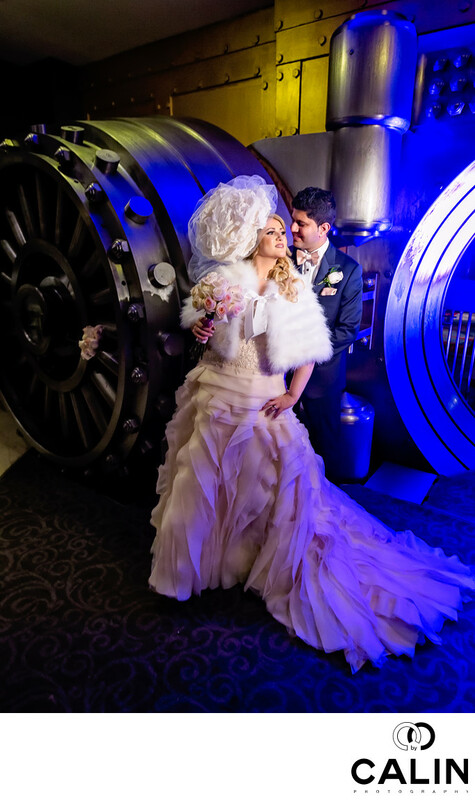 The Vault is one of the most recognizable wedding photography locations in Toronto and has been used for fashion and wedding photo shoots as well as movies. The beautiful setting matches perfectly the retro style wedding dress of this bride. In this environmental portrait of the newlywed couple, the groom is holding his bride in his arms in front of the massive door of the Vault. The blue backdrop creates a distinctive separation for the bride and groom who stand out in this image. Also, the blue light coming from the vault complements the tungsten (orange) light I used to illuminate the foreground in this scene. One of the challenges in creating this wedding picture was that I had to move very fast. Because of its popularity this beautiful wedding photography location was double booked. We had about 10 minutes to capture a few bridal party as well as bride and groom portraits. In these situations, I usually employ continuous light because I can see immediately how the picture looks like. Another limitation was to avoid the multitude of guests taking pictures with their iPhones and limiting my freedom of movement on the set. In post production I only adjusted the white balance and performed dodging the subject and burning the edges of the frame.